Nothing symbolizes eternity better than diamonds. Take your ensemble to the next level by exploring the power of black diamonds. Known for their natural healing properties as well as providing creative stimulation, black diamonds are a beautiful alternative to traditionally colorless diamonds. 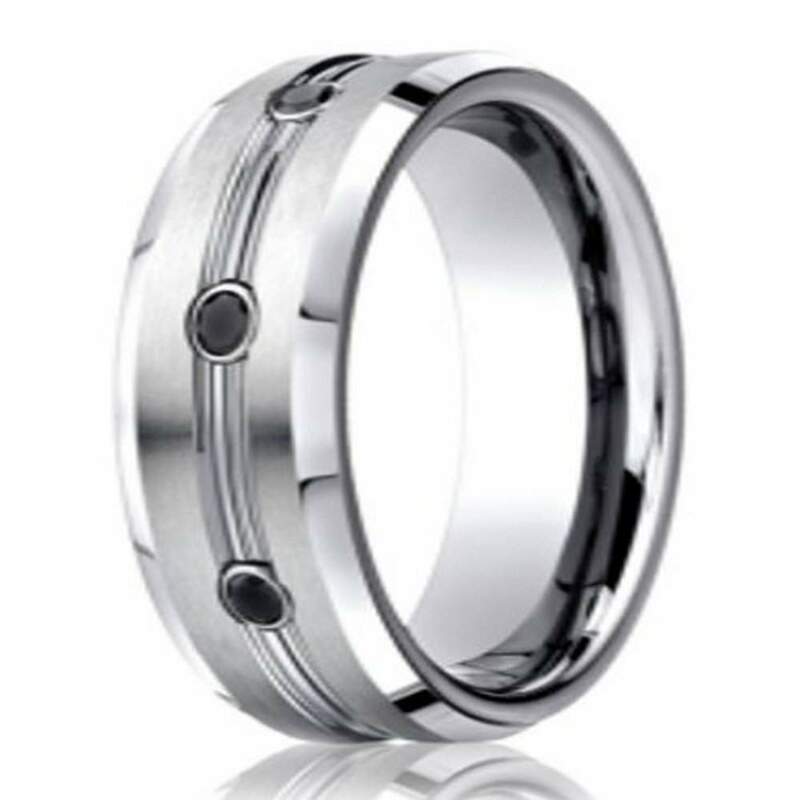 Our Benchmark cobalt chrome men’s wedding ring with black diamonds is the perfect wedding band for the modern man that is searching for something sophisticated yet utterly unique. Set against a tasteful satin finish with beveled edges and a polished center accent, the three black diamonds featured in this wedding band remain flawlessly masculine and can add the subtlest sparkle to any bold wardrobe or style. Check out our 7.5mm Benchmark cobalt chrome men’s black diamond wedding ring today! Our signature Benchmark cobalt chrome men’s wedding ring with black diamonds features superior strength and resistance to scratches or shattering. Unlike white gold or other white metals, cobalt chrome will retain its premium white color for an entire lifetime. Not only are black diamonds an affordable solution, but cobalt chrome allows you to stick to your budget without sacrificing quality. Rest assured, cobalt can be carefully removed in the event of an emergency. Furthermore, cobalt is a popular material used in manufacturing surgical tools, so it is an ideal choice for men with skin sensitivities or known allergies to certain metals. Our 7.5mm Benchmark cobalt chrome men’s black diamond wedding ring will undoubtedly remind you of the sweet promises you make on your wedding day. To learn more about our custom engraving services, contact JustMensRings.com today! My husband loves his Benchmark Cobalt ring! My husband absolutely loves the ring i got him. It's the most amazing ring and it looks so wonderful on his hand. The black diamond's add such a uniqueness to the ring. When I found it I knew it was the one!